To see full issues of the mitZine, go to the publication’s Scribd page. mitZine Vol. 11, Issue 5. April 2012. 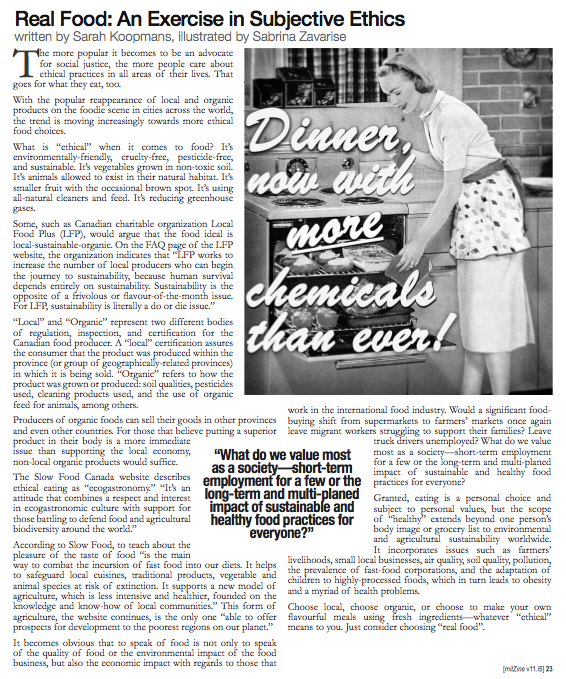 Article “Real Food: An Exercise in Subjective Ethics”. Page 23.
mitZine Vol. 11, Issue 4. Feb. 2012. 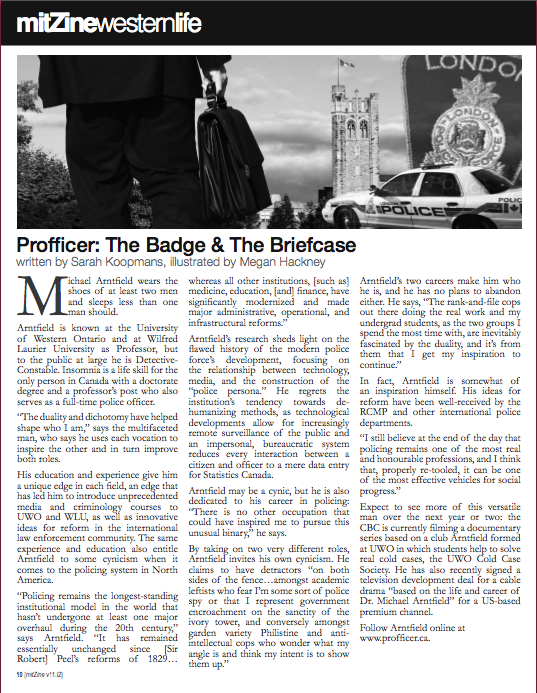 Article “The Badge and the Briefcase”. Page 10.
mitZine. Vol. 11. Issue 3. Dec 2011. 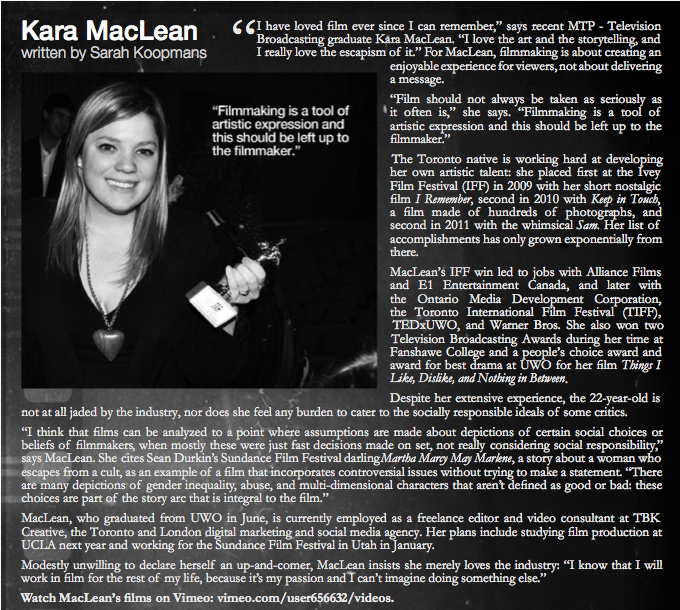 Article “Kara McLean”. Page 9.
mitZine. Vol. 11. Issue 2. Oct 2011. 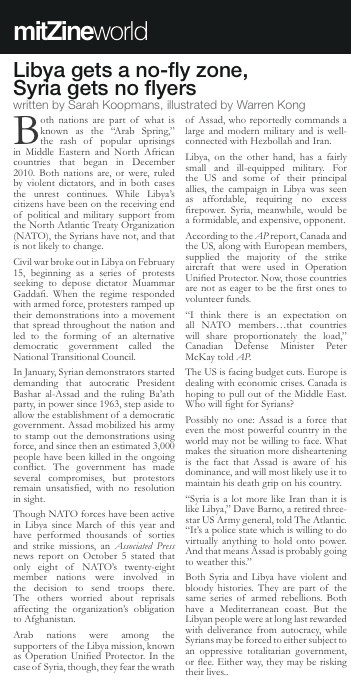 Article “Libya Gets a No-Fly Zone, Syria Gets no Flyers”. Page 15.
mitZine Vol 11 Issue 1. September 2011. 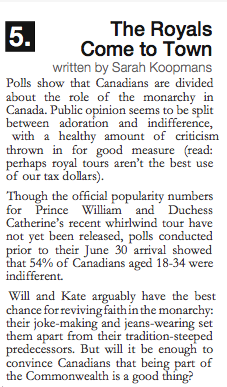 Article “The Royals Come to Town”, page 17. Student Health 101. September 2011. “Volunteer Foot Patrol Works to Keep Campus Safe” . Page 21.
mitZine Vol. 10. April 2011. Article “Yes we Love This Country”. Page 12. Bayfield Breeze. Volume 2. Week 14. Issue 91. March 30, 2011. “Hannah Georgas Fills Town Hall with Powerful Vocals”. mitZine. Vol. 10. November Issue 2010. “Breaking the Binaries”. Page 9.